take action now by getting involved with others! We strongly encourage you to consider getting involved with the organizations highlighted here. We don't run any of them, but feel they're worthwhile ministries to support. A year later, a contaminated drinking water crisis continues in Flint, Michigan and it has led to an unprecedented need for help. Officials acknowledged that the city's water supply had been contaminated with lead and had poisoned local children. 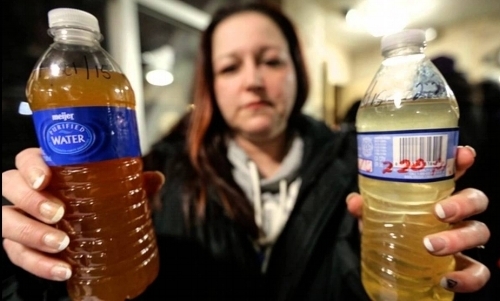 Josh Sanburn at Time Magazine writes: "Today, Flint has largely dropped out of the national headlines, but the battles unleashed by the public-health disaster are far from over. Flint's residents still can't drink the water without a filter, requiring most families to rely on bottled water for everything from brushing their teeth to cooking and bathing." You can make a donation to the United Way of Genesee County. Donations can be made to a fund that's already helped purchase and distribute 11,000 water filter systems, 5,000 replacement filters and thousands of cases of bottled water. The scripture, Matthew 2: 13-23 reminds us that the baby Jesus and his family were refugees, fleeing violence and persecution in their Middle East home. We cannot help but think of the refugees fleeing violence and persecution in their Middle East homes now. We cannot help but think of the refugees fleeing Syria in our time. Interfaith Council for Peace and Justice (ICPJ) inspires, educates, and mobilizes people to unite across differences and to act from their shared ethical and spiritual values in pursuit of peace and justice. ICPJ's campaign, "One Human Family" works to address issues of immigration and refugee resettlement. All people deserve to feel welcome in this home and nation we share. We want our Muslim sisters and brothers to know that when they are so unfairly condemned we will speak out more loudly to defend them. The Poor People’s Campaign: A National Call for Moral Revival has emerged from more than a decade of work by grassroots community and religious leaders, organizations and movements fighting to end systemic racism, poverty, militarism, environmental destruction & related injustices and to build a just, sustainable and participatory society. The Campaign aims to build a broad and deep national moral movement — rooted in the leadership of poor people and reflecting the great moral teachings — to unite our country from the bottom up. The Russia with Love group works to establish relationships and engage others with activities supporting church renewal and outreach to the needs of the poor in Russia. A partnership of individuals from Ann Arbor area congregations with a Danish Lutheran Society and the Russian Orthodox Church, work to minister to crucial human needs in Russia. With rising tension between the United States and Russia, pursuing efforts to build trust and recognize our common humanity are important now more than ever before. We have all over-used the planet. There is too much CO2 in the atmosphere and this is resulting in Global Warming. So the climate needs fixing. The need to limit Global Warming to 2°C was agreed by World leaders in 2015. But the action is too slow. The effects of Climate Change are already with us and getting worse. We simply cannot continue to keep doing what we are doing now. Climate Change may become irreversible if we don't act fast and on a massive scale. We've got a couple of ideas on how to help save the earth. Rather than creating new programs that reinvent the wheel, we can multiply the impact of our service by getting involved with the people and organizations in the community already doing God’s work by forging creative partnerships. "You can support our partners, work with the church, or connect with other organizations to begin to create change now — and do justice."